Burnbrae Gardens resident Madeline McCarthy poses during her 106th birthday party with the home’s administrator April Faux on Sept. 17. CAMPBELLFORD, Ont. – The activity room at Burnbrae Gardens was packed on the afternoon of Sept. 17 with about 45 residents, staff and family members as everyone gathered to wish resident Madeline McCarthy a happy 106th birthday. The celebration began with everyone singing Happy Birthday to Madeline. Her family members and Burnbrae staff members then queued up to take photos with Madeline before the day’s musical entertainment kicked off the celebration at 2:30 p.m. The nutritional care team made an assortment of fancy cupcakes for the party’s attendees to enjoy. Madeline was born Sept. 17, 1912, and grew up in Campbellford. The resident recalls how she took a horse and buggy to class while a student at Campbellford District High School, picking up classmates on the way. Upon completing high school in 1929, Madeline went to work in the office at Swift’s Meats. She married Joe Bolton in September 1937 and the couple raised two sons, John and Michael. After Joe passed away in June 1966, Madeline married Ferg McCarthy in 1969. 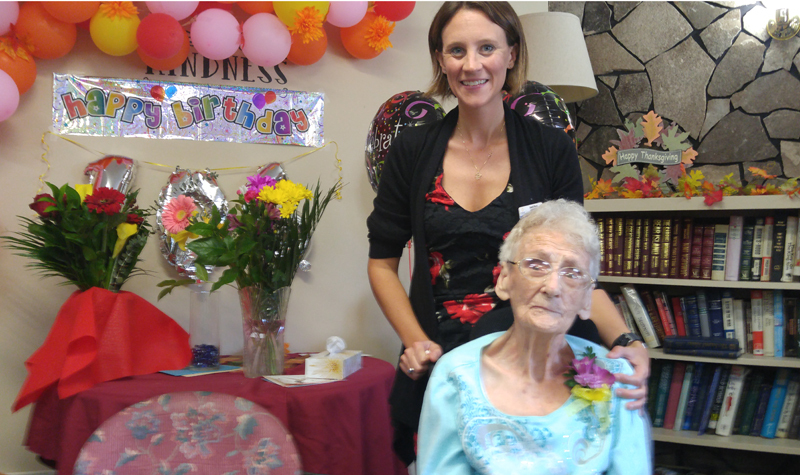 Burnbrae Gardens administrator and life enrichment co-ordinator April Faux says Madeline had been looking forward to celebrating her birthday with everyone. While Madeline said she didn’t have any words of advice offer the crowd, she did say she was grateful to all for coming. “Thank you,” she said with a smile.